The monoclonal antibody will detect native human VEGFR-2 / KDR in ELISA experiments and on the surface of different human cell types. It recognizes the transmembrane KDR e.g. in HUVECs which normally is fully glycosylated (200kDa form). Recombinant fragment corresponding to Human VEGF Receptor 2 aa 20-757. Recombinant human soluble VEGF Receptor 2. HUVEC cells. IHC-P: FFPE human placenta. Our Abpromise guarantee covers the use of ab9530 in the following tested applications. ELISA Use a concentration of 1 - 5 µg/ml. IHC-Fr Use a concentration of 1 µg/ml. Flow Cyt Use a concentration of 2 - 10 µg/ml. Receptor for VEGF or VEGFC. Has a tyrosine-protein kinase activity. The VEGF-kinase ligand/receptor signaling system plays a key role in vascular development and regulation of vascular permeability. In case of HIV-1 infection, the interaction with extracellular viral Tat protein seems to enhance angiogenesis in Kaposi's sarcoma lesions. Defects in KDR are associated with susceptibility to hemangioma capillary infantile (HCI) [MIM:602089]. HCI are benign, highly proliferative lesions involving aberrant localized growth of capillary endothelium. They are the most common tumor of infancy, occurring in up to 10% of all births. Hemangiomas tend to appear shortly after birth and show rapid neonatal growth for up to 12 months characterized by endothelial hypercellularity and increased numbers of mast cells. This phase is followed by slow involution at a rate of about 10% per year and replacement by fibrofatty stroma. Phosphorylated. Dephosphorylated by PTPRB. Dephosphorylated by PTPRJ at Tyr-951, Tyr-996, Tyr-1054, Tyr-1059, Tyr-1175 and Tyr-1214. Detection of VEGFR-2 extracellular domain of human umbilical vein endothelial cells (HUVEC) using monoclonal antibody VEGFR-2 (bold) versus control conditions. IHC image of VEGF Receptor 2 staining in human placenta formalin fixed paraffin embedded tissue section, performed on a Leica Bond system using the standard protocol F. The section was pre-treated using heat mediated antigen retrieval with sodium citrate buffer (pH6, epitope retrieval solution 1) for 20 mins. The section was then incubated with ab9530, 1µg/ml, for 15 mins at room temperature and detected using an HRP conjugated compact polymer system. DAB was used as the chromogen. The section was then counterstained with haematoxylin and mounted with DPX. Immunocytochemical analysis of human aortic endothelial cells, labelling VEGF Receptor 2 with ab9530 (green). Cells cultured until 70% confluent and fixed with 4% paraformaldehyde for 15 minutes at room temperature. They were then incubated with ab9530, diluted in PBS containing 5% normal goat serum and 0.01% Triton X-100 at 4°C overnight. DAPI used to stain nuclei. Immunocytochemistry/ Immunofluorescence - Anti-VEGF Receptor 2 antibody [EIC] (ab9530)This image is courtesy of an anonymous Abreview. ab9530 staining Human aortic endothelial cell by ICC/IF (Immunocytochemistry/immunofluorescence). Cells were fixed with paraformaldehyde, permeabilized with 0.1% Triton X-100 and blocked with 5% serum for 20 minutes at 22°C. Samples were incubated with primary antibody (1/2000 in PBS + 0.1% Triton-X 100 + 5% Goat serum) for 12 hours at 4°C. An Alexa Fluor® 488-conjugated Goat anti-mouse IgG polyclonal (1/1000) was used as the secondary antibody. Green - VEGF Receptor 2, Red - alpha tubulin, Blue - nuclear marker (DAPI). 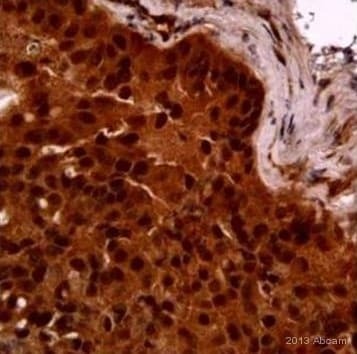 IHC - Wholemount - Anti-VEGF Receptor 2 antibody [EIC] (ab9530)This image is courtesy of an anonymous Abreview. Wholemount Immunohistochemical analysis of lung tissue from a 6 day postnatal mouse, labelling VEGF Receptor 2 with ab9530. ab9530 was diluted 1/500 in 3% BSA and 0.1% Triton 100 in PBS buffer, and incubated at 4°C for 12 hours. The secondary used was a polyclonal Alexa Fluor 488 Goat Anti-Mouse IgG at 1/1000. 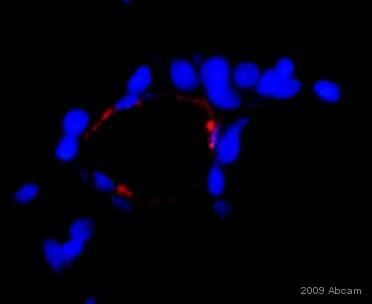 ab9530 staining rat lung cells by ICC/IF (Immunocytochemistry/immunoflurescence). Cells were fixed with paraformaldehyde and blocked in 5% normal goat serum for 1 hour at room temperature. Samples were incubated with primary antibody (dilution 1/50) for 14 hours at 4°C; the diution buffer was 5% NGS in 1 X TBS-T (0.1%tween20). A Cy3® -conjugated Goat polyclonal to mouse IgG, dilution 1/100, was used as secondary antibody. Publishing research using ab9530? Please let us know so that we can cite the reference in this datasheet.